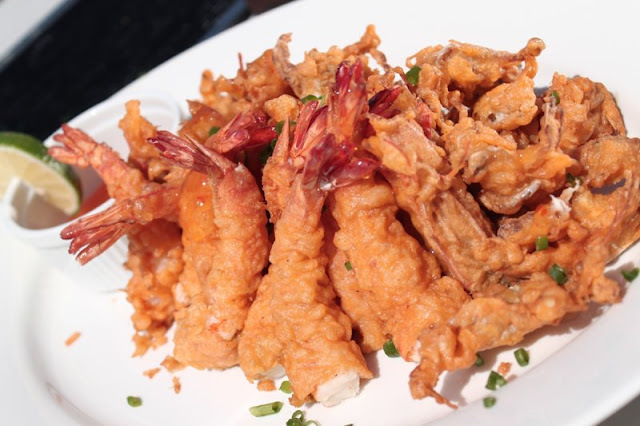 Camaron Rebosado with Crispy Crablets is both familiar and new. While it is a classic favorite as a filipino hors d' oeuvre, Chef Boy's masterly technique transforms it to an authentic culinary adventure. 1. Remove shell of tiger shrimp but leave tail and set aside. 2. Cut into cress-cut back to back then place on platter with corn starch pressing each piece to become straight. 3. Have ready fat heated oil. 4. Mix egg, corn starch, all purpose flour, water, tomato paste, salt and pepper. 5. Dip tiger shrimp into camaron dough then deep fry into oil until done. 6. Do same with crablets - dip into camaron dough and deep fry to become crispy. 7. Arrange on platter and side with sweet chilli sauce and vinegar sauce with chili and onion.